Tim Tebow has reached a new level of popularity last weekend when he shined in the over time. He set a new Twitter record for the most sports related tweets per second. On Saturday his team the Denver Broncos will face off against the New England Patriots. The Patriots also have a star quarterback with Tom Brady. The combination should lead to top ratings for the broadcast. Tom Brady has already three SUper Bowl rings and has owns two Super Bowl MVP Awards. Tim Tebow is the newcomer, but he is coming on strong. Tebowing is world-wide meme. Tim Tebow is not everybody's darling because of his religious views, but that controversy is even amplifying his popularity. If the Patriots make it to the Super Bowl, we might end up calling the Super Bowl 2012 "Tebow Bowl." Tim Tebow and the Bronco's lost badly to the Patriots. 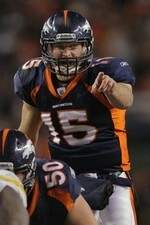 Tim Tebow will not play the Super Bowl 2012.